With proper care, teeth that have undergone endodontic (root canal) treatment will last as long as other natural teeth. In some cases, however, a tooth that has received endodontic treatment fails to heal. Occasionally, the tooth becomes painful or diseased months or even years after successful treatment. If your tooth has failed to heal or has developed new problems, you may have a second chance. Another endodontic procedure may be able to save your tooth. Endodontists use advanced technology along with their special training and experience in treating these difficult cases. Complicated canal anatomy that went undetected during the initial treatment. Bacteria present in the saliva re-contaminated the inside of the tooth due to a deficiency in the crown or restoration. 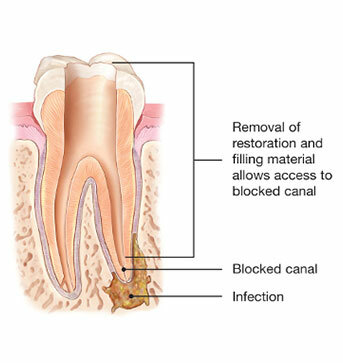 New tooth decay can expose the root canal filling material to bacteria, causing reinfection. 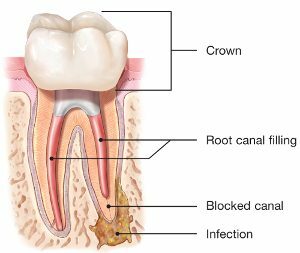 A cracked or loose filling or crown can expose the interior of the tooth to new bacteria. The tooth had sustained a fracture. The endodontist will reenter the tooth to remove the original root canal filling material and then clean the canals while carefully examining the inside of the problematic tooth. After removing the canal filling, the endodontist will search for any additional canals or unusual anatomy that requires treatment. After endodontic retreatment, you will need to return to your dentist soon to have a new crown or restoration placed on the tooth for protection and restoration of full functionality.